So you need a change of pace, to get away from everything. 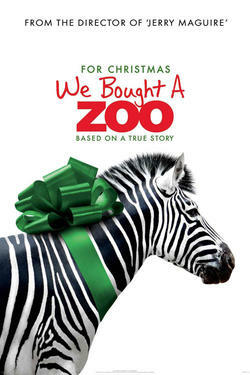 You could pack up the kids and head on vacation for a week at a national park OR you could buy a zoo like Benjamin Mee did in the film “We Bought a Zoo.” Based on a true story of a dad who led his family into a new adventure, “We Bought a Zoo” is a delightful Christmas movie for the whole family. Directed by Cameron Crowe (“Say Anything,” “Almost Famous”) “We Bought a Zoo” doesn’t just tug at your heartstrings as a fun film, it actually makes you think about your life and what you are doing to live your life with purpose. While your kids will fall in love with the porcupine and tigers (be prepared to get your child a stuffed tiger toy this holiday), you will be wondering if you’re leading the life you want. What would happen if you took chances? There is a great quote from the film “Sometimes all you need is 20 seconds of insane courage and I promise you something great will happen.” What if you actually took chances and did things that scared you that could actually improve your life? Of course, “We Bought a Zoo” is also purely entertaining. Starring Matt Damon as the dad, Scarlett Johansson as the young veterinarian at the zoo and Thomas Haden Church as Benjamin’s brother, “We Bought a Zoo” is amusing and smart. If you are an animal lover, this is a film that you will see more than once and Matt Damon fans will enjoy seeing a new tender side of this actor. While Damon is a solid action style actor, the moments onscreen between Benjamin and his kids Dylan (Colin Ford) and Rosie (the effervescent Maggie Elizabeth Jones) highlight a new facet of this actor’s talent. Colin and Maggie nail it as Dylan and Rosie (complete with tween angst and innocence), kids who were uprooted from their home after their mother’s death and moved by their dad to a new environment, a dilapidated zoo with 200 exotic animals. Thomas Haden Church is, as always, sublime as the smarmy brother against the idea of Benjamin moving his family (and his money) to a dilapidated zoo and Scarlett Johansson is perfectly cast as Kelly, the veterinarian trying to save the animals. Cameron Crowe’s signature is stamped all over this film from the perfect soundtrack to the lines you’ll remember (In this case, “Their happy is too loud”). If you’ve grown up with Cameron Crowe (John Cusack holding up the boom box in “Say Anything”) you’ll enjoy this new adventure with him. And as Benjamin’s brother says to Benjamin is this film “What people need is joy, sunlight and human interaction.” What a great message for this holiday season. For more on Cameron Crowe's music and his films, read this insightful article from the cool folks over at Movieline.com. I'll bet you buy at least one soundtrack.